The Foundation for Medical Cooperation of Korea is established with the sense of urgency that we should not neglect the terribly poor medical care condition in North Korea any longer. Also, in this time of reconciliation and coexistence, construction of new peaceful relationship with the North Korea would be the gateway to the peace in northeast Asia as well as entire world. The South and North relationship has been progressing since the historical 6.15 inter-Korea summit talks in spite of some diplomatic turbulence from time to time. Although we cannot rule out the possibility of another war in Korea, we are gradually approaching the peaceful reunification with increased personal and material interchange. Above all, there have been steady relief activities both on governmental and non-governmental levels to help North Koreans suffering from the failure of economic policy and natural disasters. In the past, the humanitarian aid to the North Korea has been focused on the emergency services and food aid rather than overall restoration and re-building activity. Recently, government aid has changed its direction to the restoration and rebuilding by reinforcing supports in agricultural restoration and medical care. However, aid in medical care area is still very poor. There is hardly any humanitarian aid to the North Korea has been focused on the emergency service and food aid rather than overall restoration and re-building activity. Recently, government aid has changed its direction to the restoration and rebuilding by reinforcing supports in agricultural restoration and medical care. However, aid in medical care area is still very poor. There is hardly ant functioning public health care service in North Korea due to the severe food shortage and economic slump. Despite the fact that North Korea’s medical care system is rooted in socialism, the idealistic free treatment is impossible considering the lack of basic medical supplies and medical equipments. Deteriorated medical system results high infant mortality rats and short life expectancy and prevalence of epidemics. Poor medical care condition is also threatening to the labor force in North Korea. The Foundation for Medical Cooperation of Korea has great potential to contribute to the peaceful re-unification of the nation. First, the foundation will increase personal interchange between the South and North by linking medical service providers. Second, the foundation will campaign for building small size hospitals with more than 30 beds in the cities of 200,000 or 300,000 population which would be the basis for centric hospitals for the regional medical care system. Third, Project to construct the trust with the north by building the medical foundation and supplying the medical equipments and medicines. Fourth, Project for supporting the pharmaceutical industry to enter North Korea and the Gaesung industrial complex. Fifth, Building up a unified network of all the currently participating medical aid institutions and organizations in North Korea for more efficient health and medical care aid. Sixth, Working in collaboration with foreign institutions and organizations providing humanitarian aids to North Korea. With the activities mentioned above, The Foundation for Medical Cooperation of Korea will try to develop medical infrastructure of North Korea with steady and continuous support while maintaining the transparency of the foundation. As a co-chairman of the Green Doctors, I perceive great potential of The Foundation for medical Cooperation of Korea project in Gaesung industrial complex. The Green Doctors organization is doing its best preparing to build a hospital with 100beds in Gaesung in order to improve the medical care system in North Korea. The improvement of the North Korea medical care system is an essential element for the recovery of the North Korean economy and trust building process for re-unification. Along with all the persistent and sincere efforts throughout the government and society, The Foundation for Medical Cooperation of Korea will also use our utmost in order to contribute to the peaceful re-unification of Korea. 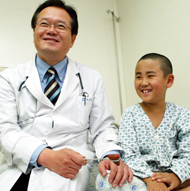 Copyright© The Foundation for Medical Cooperation of Korea. All rights reserved.